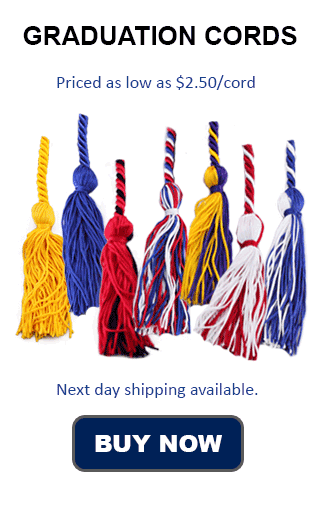 Honor Society Graduation Cords come in a variety of colors. For some of the organizations listed below, you can buy official society cords through Honors Graduation. For the others, you can click the links to see a comparison of our cords with the cords (if any) offered by the official organization website. Cords bound to be worn by students in various honor societies is probably one of the chief reasons we sell honor cords. Honor Cords and Honor Societies share fifty percent of their name with one another. Students in the top of their class deserve to be recognized for their achievements, and graduation honor cords are a great way to do that. Do you need individual cords (single & multi-color), two cords tied together, or three cords tied together? At Honors Graduation we pride ourselves on having the finest quality honor cords ready to ship out upon order for any honor society needs. Most orders are sent the same day they were ordered, unless it is too late in the day. We also offer a wide variety of shipping options. We do this because we understand the time sensitive nature of graduation supplies, and know that the students often need to get them quick! Every Honor Society at every level has their own colors. These colors can easily be translated into honor cords and worn to show accomplishment and pride in what a student has done. Single Honor Society Graduation Cords, braided cords, double cords, and even triple cords can be used to show membership in an honor society.